The Genesis Drip Irrigation System was created for gardeners and growers who are looking to conserve water consumption by delivering the right amount of water directly to the root system of the plants. Genesis also offers additional accessories to allow for the grower to customize their own system to fit their own personal needs. This kit is Specifically designed to meet the needs of the Hobby greenhouse grower. This Genesis kit is actually 2 kits in 1. The first part of the kit includes 48 drippers designed for container and planter growing. The second part of this kit includes 4 misting sprinklers designed to increase the humidity level inside of your greenhouse. Our kit is designed to cover up to an 8ft x 24ft greenhouse and up to 48ft long greenhouses for single watering options. For larger greenhouses, additional kits can be connected together to gain additional coverage. The design is customizable and expandable. Includes 48 drippers for container/ planters (12 sets of 4), 4 misting sprinklers for humidity, 48ft of hose for water supply. The Berkley's traditional gambrel design features a 10 Ft. high peak with plenty of height to add a loft for extra storage space. The 6 Ft. high side walls offer ample wall space to long-handled garden tools and other outdoor equipment. Extra-wide double doors with premium locking lever help keep your outdoor items secure. Paint and shingles sold separately. Check with your local code authority before placing your order. BUILDING SHOWN WITH OPTIONAL ACCESSORIES. Not available in Quebec Market. Available in store by Special Order Only. See associate for details. The Havahart Feral Cat Trap Rescue Kit is ideal for catching, transporting and short term caring of a feral cat. The Havahart Feral Cat Trap Rescue Kit is easy to set, bait, and release. Collapsible live animal trap for the catpops up in seconds. Kit includes; rescue cat trap, cage divider, cover, door hook, and complete instructions. Rescue Collapsible Cat Trap: This cat trap is 32 x 10.75 x 12.75 when assembled. Constructed of sturdy rust-resistant wire mesh with steel reinforcements for long life and is galvanized for maximum resistance to rust and corrosion. Collapsible design is ideal for space saving storage! Cage Divider: The divider allows the cage to be used as a feeding and watering area. Slide it through the cage mesh, open the door and place food or water in the cage. Burlap Cover: The cover has a dual purpose: to help camouflage the trap and to soothe the cat once it is trapped. The Marshalltown Finisher's Totes are made of double layer durable water resistant nylon with a rigid reinforced base and stiffened side panels. The are open ended with bracket windows to fit any length pole, bull float or fresno. 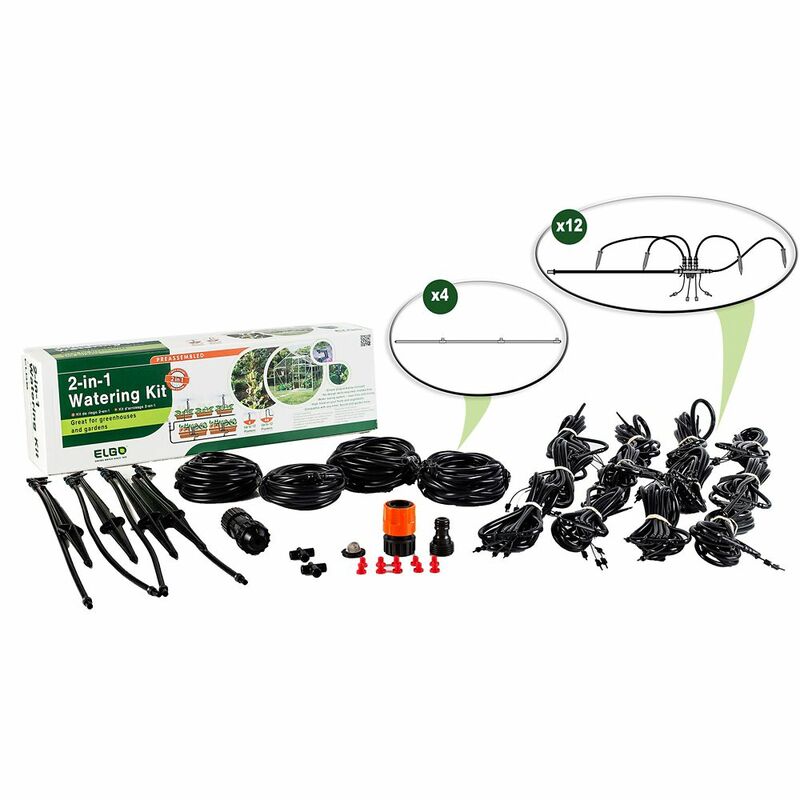 48 ft. Greenhouse Dripper Kit The Genesis Drip Irrigation System was created for gardeners and growers who are looking to conserve water consumption by delivering the right amount of water directly to the root system of the plants. Genesis also offers additional accessories to allow for the grower to customize their own system to fit their own personal needs. This kit is Specifically designed to meet the needs of the Hobby greenhouse grower. This Genesis kit is actually 2 kits in 1. The first part of the kit includes 48 drippers designed for container and planter growing. The second part of this kit includes 4 misting sprinklers designed to increase the humidity level inside of your greenhouse. Our kit is designed to cover up to an 8ft x 24ft greenhouse and up to 48ft long greenhouses for single watering options. For larger greenhouses, additional kits can be connected together to gain additional coverage. The design is customizable and expandable.